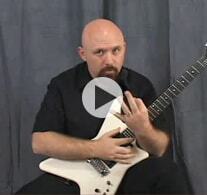 If you are frustrated with trying to learn sweep picking on guitar, you are not alone. For most guitar players, sweep picking is a difficult technique to master. As you have seen in the first part of this video lesson, one of the requirements of great sweep picking technique is to move your picking hand in a very specific way, to keep it in sync with your fretting hand. Focusing on the subtle movements in your guitar technique is essential for mastering sweep picking on guitar. Move closer to mastery of sweep picking right now. Simply enter your name and email, then click the "Show Me The Video" button to enter. All information is kept 100% private and confidential.